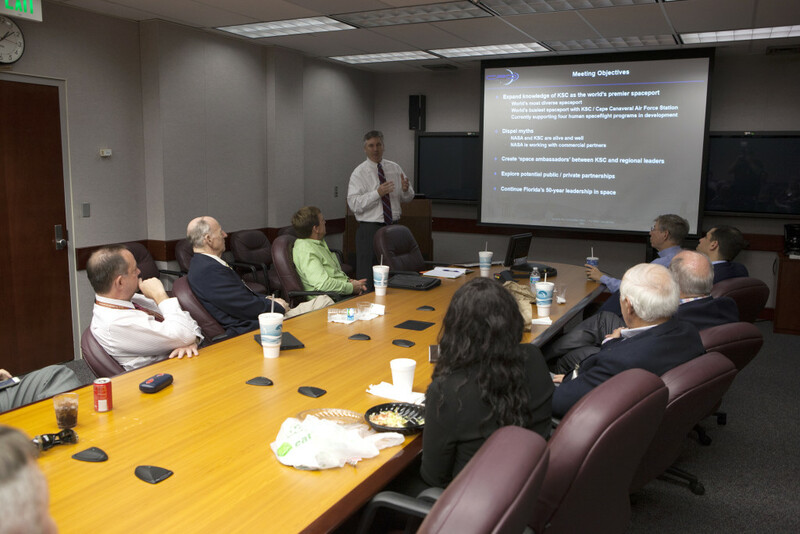 The Center Planning and Development (CPD) Directorate hosted its fifth roundtable discussion Feb. 4 at NASA’s Kennedy Space Center in Florida. Government and industry representatives toured facilities, including the Vehicle Assembly Building, Launch Pad 39B, and other facilities that have been upgraded to make the center a multi-user spaceport. Scott Colloredo, CPD director, presented an overview of the center’s core strategies and the partnerships forged with commercial aerospace and industry companies. He led a panel discussion to receive panelists’ feedback on continued development of the center, how to get the message out to potential partners, and thoughts on the future of the center. Participants for this roundtable included, Keisha Rice, former director of the Florida Office of Trade, Tourism and Economic Development; Mike Powell, CEO of the Titusville-Cocoa Airport Authority; Bill McCollum, former congressman and state of Florida agriculture commissioner; Marshall Heard, retired Boeing senior executive; Lee Solid, retired Rockwell senior executive; Louie Laubscher, Enterprise Florida; Frank O’Dea, Florida Department of Transportation, District 5; and Jesse Panuccio, former director of the Florida Department of Economic Opportunity.